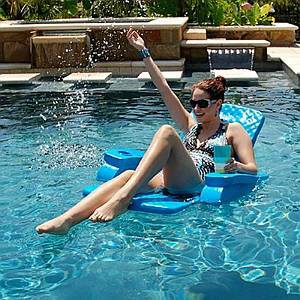 Enjoy hours of pool relaxation and sun tanning in your luxurious floating chair. Unlike inflatables this chair will last for years. Made of super soft, forever buoyant ensolite foam our chair has an integral steel frame for support and the back folds down for easy storage. Covered in vinyl our chair is luxurious, yet resists scrapes and tears. Available in blue.